Our lawn mower broke the other day. Well, it didn't actually break entirely, it was just the self-propulsion feature that went a little bit kapooy. As Steve was manfully maneuvering the mower around the yard, sans the aforementioned self propulsion feature (still impressed?) he got to chuckling a little bit because he said that it reminded him of those Really Old Olden Days when the self propulsion feature on EVERY single lawn mower was simply . . . one's self! Anybody else remember those days? I sure do! In fact, I have gathered up a few of my mower memories and am hereby about to fling a few of them in your general direction. When I was a kid, summertime for my five siblings and me meant going to visit my Grandma and Grandpa Michaelson's house in Onamia, a small community in northern Minnesota. They had an expansive lawn reaching out in every direction--to the road out front, to the cottage in the back, and to the barn on the side. That vast remodeled barn actually served as the site of Grandma and Grandpa's business which was called, "Mike's Second Hand Store." They sold furniture and antiques and dishes and clothes and toys and a whole bunch of bunches of stuff. For me, visits to their place meant getting to spend hours and hours wandering through that cool, dim, delightful, musty space. It was a wonderland for any child, but especially a child with an imagination who constantly pictured stockpiled adventure waiting around every cobwebbed corner. Of course, being the grandchildren of the proprietor, my siblings and I always got to choose "a little something" for ourselves during each visit. That opportunity created for me the most wonderful agonies of indecision as I carefully perused miles and miles of treasures and junk for that one special thing I wanted to take home. In between all the blissful barn meanderings however, there were chores that had to be done. And one of those chores was to help mow The Lawn. The Ginormous Gigantic Incredibly Massively Monstrous Lawn. Did I mention it was big? 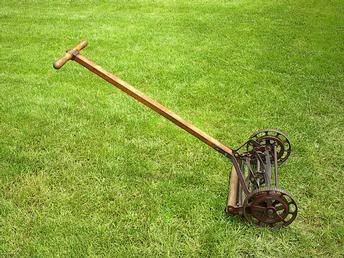 No, what we used to mow lawns with "back when I was a kid" (a line guaranteed to induce eye-rolling in teenagers) was an antique-type mower with rotating blades that looked a lot like this. I became very well acquainted with that mower while I was growing up. And as the official self propeller of an officially non-self propelled lawn mower, I had to develop and master certain skills in order to achieve mowing success. For instance, if the grass had gotten extra tall between mowings, I would have to take three or four steps backward with the mower and then RUN as fast as I could into the tall grass. Otherwise, the grass would clog up the blades and I would rather quickly come to an ignominious halt. Occasionally however, not even my much touted, frequently practiced "back up and run" mowing technique would work and I'd find myself soundly defeated by the mean, Minnesota grass. I would stand silently for a few forlorn moments under the searing sun. And I would sweat. And then I would carefully examine the callouses on my thumbs to see if any of them might merit a trip to the (cool) emergency room. And I would scratch the mosquito bites on my grimy, spindly legs. And I would wonder if bursting into pitiful, feminine tears would bring Grandma running outside to soothe my furrowed brow and lovingly ply me with icy, hand squeezed lemonade. But as tempting as the tears were, I usually managed to tough it out. I usually managed to continue providing my own personally powered propulsion to that ornery old contraption, a machine that never did seem to be overly interested in cooperating with The Campbell Kids' Summer Grass Cutting Program. But oh the CALORIES I burned up while engaged in mortal combat with that mower! No wonder I was such a skinny little eleven-year old. I could have eaten a whole side of beef, a bushel of potatoes and five apple turnovers and burned up every single calorie in a scant two hours of mowin' and moanin'! When it was all said and done though, my very best memories from those long ago summer days were when that crabby lawn was finally subdued and we all gathered around the Formica table in the kitchen to enjoy Grandma's grand cooking. It was during those periods of rest and relaxation that I truly understood and appreciated the joy of a hard job well done. Summers in the seventies. A cantankerous lawn mower. A barn full of treasures and memories. Loving grandparents long gone and long missed. Pieces of the days that made up the years of my life. My neighbor, the father of The Danger Boys (and no, Danger is not their surname), still mows with a reel mower like the one in the photo. Ah, I remember it well. Although our lawn was not huge, it seemed that way to a mere child given the responsibility of mowing it. My brother and I took turns. I actually loved mowing the lawn, the smell of freshly shorn grass being my favorite part. I also enjoyed shoveling snow. I have been thinking lately about that childhood, a time when we didn't have air conditioning. It is 112 degrees here today, and I can't imagine not having AC anymore. But as a kid, it was the most natural thing in the world. Sometimes I think if we faced this world through the heart and the eyes of a child, we would enjoy the journey so much more. Everything is an adventure, everything is much simpler, and we accept so much more as not only typical, but as perfectly alright. No comparisons to what we COULD have, just an appreciation of what we DO have. Thanks for a peek into your past. It sounds wonderful! I was amazed at how little grumbling was heard from our boys at Cub Scout camp during 3 nights spent in canvas tents, and 4 days filled with walking from activity to activity with no a/c to be found. The adults, on the other hand.... ! Loved the memories, Becky. Mine are different but precious just the same. I wonder, if my mother had kept a blog, if what she wrote would have lined up with what I remember? I just had to chime in on this entry. Firstly, I too have mowed with a true push mower, the reel type. In my list of experiences, I have also used a push mower with an engine that turned the blade. Oh, and I tried my grandpa Smith's sithe once. . . talk about a tough way to mow grass! Maybe that's why he chewed tobacco (not a very precise spitter). . . as bad as the stuff tasted it must have made using the sithe a joy!? OK, you are not going to believe this but I have never mowed a lawn! In fact, this summer was the first time that I was responsible for a lawn. Me and my 20 year old son John. Neither of us had any idea of how to do it- It was hilarious... Gas??? Where do you get gas? What do you keep it in? Where do we buy one of those? How much goes in the mower? What kind of gas? We can't get the bag off the mower! Wait, can't get it back on either! We just mowed it 6 days ago, it needs it again?? You have to overlap the rows? What do we do about the edges? A weedwacker? What's that? Does that use gas too?How often are we going to have to do all this? Really. We are pathetic. I actually took a picture of 'John's first time mowing the lawn' to save with all his other 'firsts'. I really liked your "pieces of the days that made up the years of my life" line. Such a poignant way to describe how life gets put together. I also loved your trip down memory lane. It made me miss those days and grandma and grandpa so much. I didn't know you had to mow the lawn that much, you poor suffering thing you. I remember doing a few swipes around the side yard with that mower, but I never had to really mow. I knew being the baby of the family had to be good for somethin'!